1. Your Battlements earn you a silver income each day, but amount can be modified. 2. This is where you can Build your Battlements. 3. Your card deck used in attacking opponents. 4. Daily you have 5 free attacks with 500 silver fee. You can buy additional ones with 30 gold (Assembly Order). 5. Battlelog. Keep track on your Battlements battles history. Your Battlements are giving you a silver income each day, but the amount you collect can be modified. Up to 5x per day, you can gain or lose upto a 50% modifier on silver income. Successful defensive battles apply a +10%, and losing a defensive battle suffers a -10% to your claimable income. The result of these defensive battles also influences the Durability of your Battlements, which changes the amount of Base Income you can get. Each Battlements level is giving you 2,500 silver. On level 20 (max) you will be able to gather and collect 50,000 silver. You can collect it every 12 hours. By upgrading your Battlements levels in City Hall you are able to increase and improve cards you can use. You can deploy defensive creatures and structures in a square grid of the last 5 rows of the battlefield. 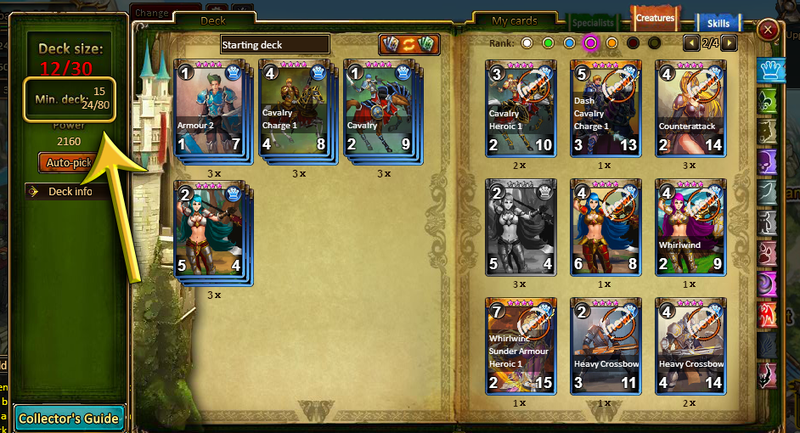 All additional cards you can use by leveling up you Battlements are Godlike. You can chose one card from three. You have two separate decks – Defense one and Attack one. 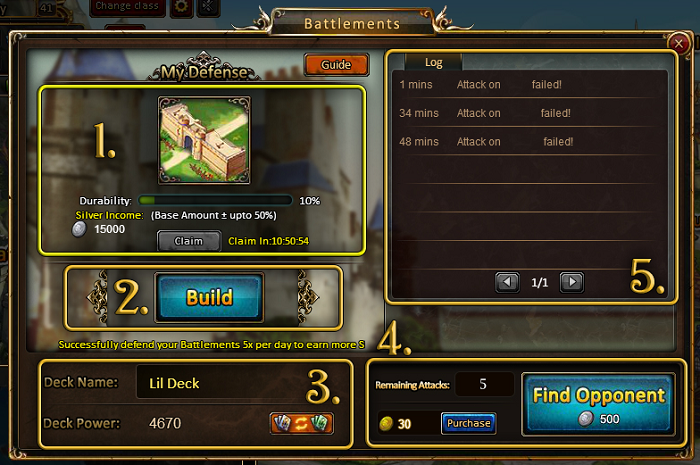 When playing Battlements there is one important change of building your Defense and Attack deck. All cards don’t have Cooldown anymore and can be played straight away but when building your deck you can have total 80 of all cards cooldown. In the left top corner, you can see how much card cooldown you already used to build your deck. Is giving you 28/80 used cooldown. 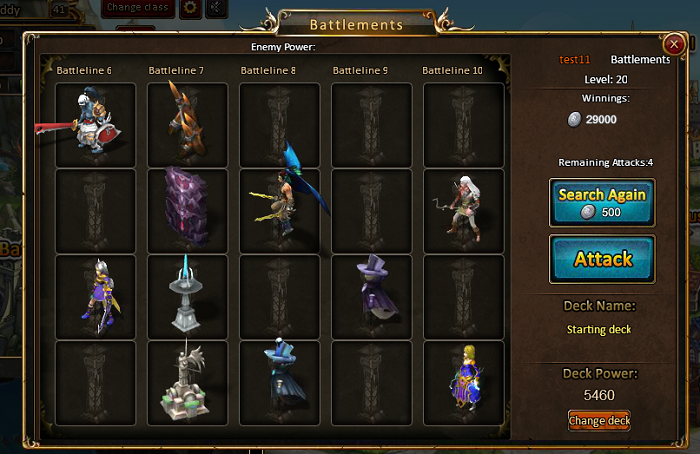 By clicking “Find Opponent” you can search for suitable enemy Battlement to attack. Your scouts will produce report on the enemies defensive structure and creature emplacements, the enemy Battlement level and the expected Silver winnings. You can also choose to search for another opponent, but each search costs 500 silver.